Food halls are so in. The entrance to Eataly at Westfield World Trade Center in New York City. As retailers like Macy's (M - Get Report) , Sears, (SHLD and J.C. Penney (JCP - Get Report) sink deeper into the pit of no return, a star in the sector has risen and is shining brightly for purveyors and customers alike. The sparkly object? Food halls. "No other retail category has generated as much aggressive expansion in the past few years as food-related retail," wrote the authors of Cushman & Wakefield's Food Halls of America, 2016 Edition. 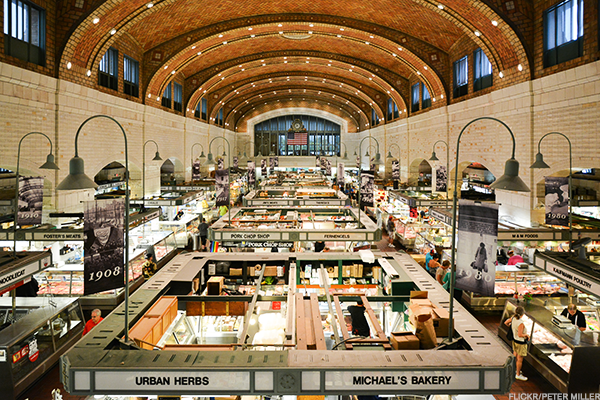 "And arguably, there is no hotter trend within the category than food halls." U.S. food halls are sprouting up everywhere, according to the Cushman & Wakefield report: in the first nine months of last year, the number of food halls increased 61%, and more are in the pipeline, especially in New York, which has a fourth of them. By 2020, according to the study, some 200 major food halls, up from 150 currently, are expected to be operating throughout the country. Food halls are thriving because customers love what they offer and the business model works better for food service professionals than owning and running a sit-down restaurant. The vendor's financial outlay is much less for setting up a food hall "stall" than opening a restaurant, which comes with burdesnome overhead costs that cuts into profits, and requires that the eatery draw the foot traffic. 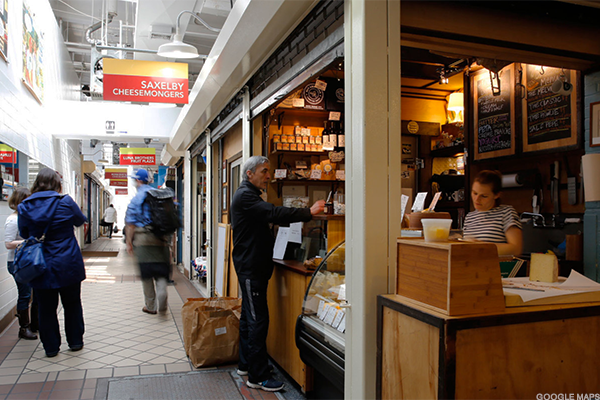 Customers are built-in at food halls, because food halls are typically at transportation hubs, or in gentrified city neighborhoods or new developments, where people are passing through on their way to someplace else and find it easy to grab a bite on the go. Food halls are not food courts, those areas in malls chockablock with fast food restaurants like McDonald's (MCD - Get Report) , Yum! Brands' (YUM - Get Report) KFC, Pizza Hut and Taco Bell and Dunkin' Brands (DNKN - Get Report) notorious coffee spot. "The food hall is about authentic concepts, farm-to-fork, slow-cooking, ethnic foods," said Garrick Brown, national retail research director at Cushman & Wakefield. They feature original dishes by celebrity chefs, ethnic cuisines or novel fusion creations from up-and-comers or vendors who may sell only craft beer or freshly roasted coffee or chocolates. A long-standing tradition in Europe, food halls pride themselves on offering quality, authentic eats that are tasty, fresh and usually produced and sourced locally. 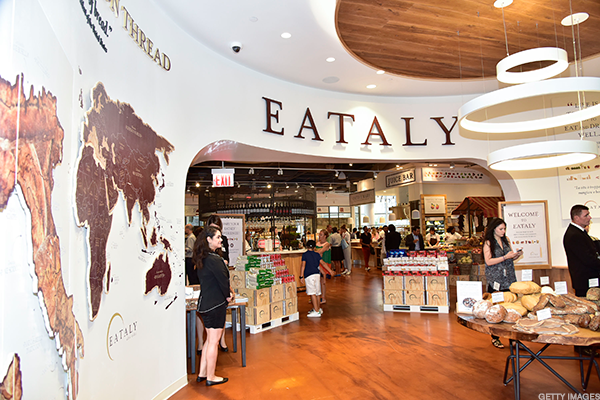 Those familiar with the food halls concept may think of Eataly, the Italian food and restaurant emporium that started in Turin, Italy, and is closely associated with celebrity chefs Mario Batali and Lidia Bastianich. It has locations in Boston, Chicago, Los Angeles and New York and key cities around the world. "We are one of the first ethnic food halls in America," said Bastianich, who is a partner in Eataly, to TheStreet. "Eataly came with a very genuine and true message of the Italian culinary culture. When Eataly was first founded in Italy with the slow food movement, it was with the idea of delivering the best that Italy has to offer from those small producers that make authentic products. Here at Eataly, we sell those products that are hard to find." Taking a page from Eataly is Michelin Star chef Jose Andres, whose ThinkFoodGroup will open an outlet next year dedicated to Spanish food in Hudson Yards, a development under construction on the Hudson River in New York City. However, "most of the growth we're seeing isn't coming from a single operator, like Eataly or [chef] Todd English [who has a food hall in the basement of New York City's Plaza Hotel]," said Brown, but from small relatively unknown vendors who may have only one location. 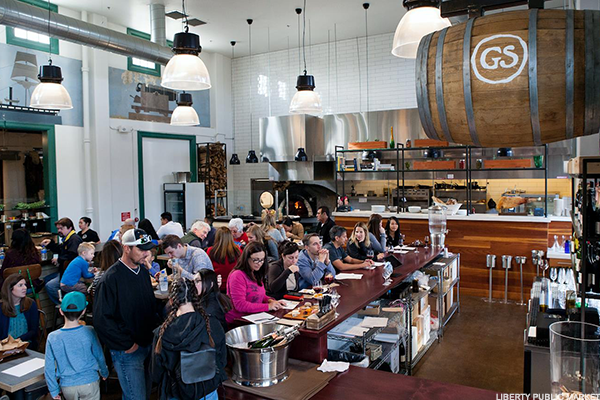 Read on to learn about food halls across the U.S.
San Diego is a Navy town, so it's inevitable that decommissioned military spaces get a second life here. Its new food hall, which opened in 2016, is on the site of the former Naval Training Station. Among the offerings are Mess Hall, a chef-driven farm-to-fork concept; Stuffed!, featuring a stuffed burger menu; Parana, empanadas; Fishbone Kitchen, a seafood restaurant and fishmonger; Lolli San Diego Sweets; and the butcher Liberty Meat Shop. This is Cleveland's oldest public market, in a building constructed in 1912, but it began operating as an outdoor market earlier, in 1840. Today, it features 100 vendors in 45,000 square feet, who sell everything from baked goods, dairy, seafood to ready-to-eat ethnic specialties that reflect the city's diversity. A stone's throw from the State Capital Building, this nine-year-old food hall has 16 restaurants and shops in 35,000 square feet. Throughout the year, it offers pop-up space for retail and eateries, cooking classes and a weekend flea market. 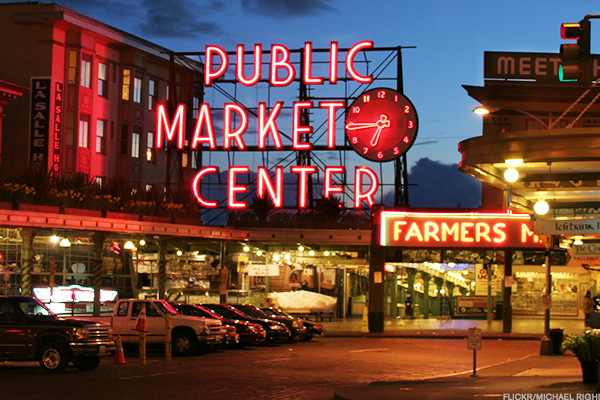 This market, with a view of Puget Sound, dates back to 1907 and is the location of the first Starbucks (SBUX - Get Report) . The center is wrapping up renovations, which added another 15,000 square feet of retail space and more than 30,000 square feet of extra public space, including a plaza and viewing deck. 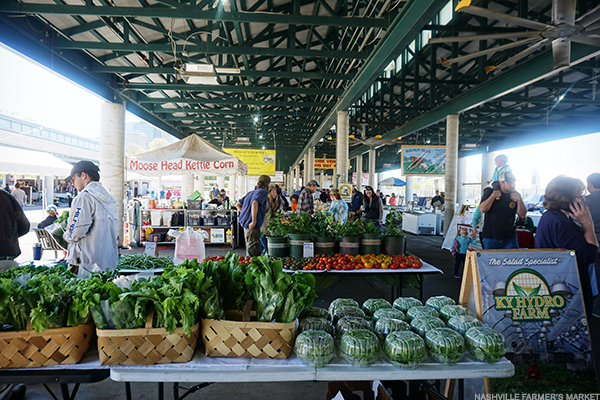 It boasts 100 vendors, including street food stalls and white-linen-tablecloth restaurants and sellers of everything from Pacific-caught fish to fresh-squeezed apple juice to Native American arts and crafts. It's also a hot tourist destination, so best to avoid Saturday afternoons. 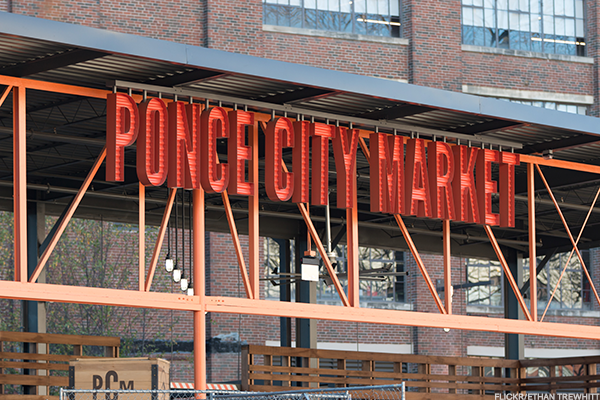 Travel + Leisure named Ponce City Market one of the Best New Food Halls of 2016, and it's easy to see why. Its location on some 30,000 square feet is in a former Sears building in a newly gentrified neighborhood called Old Fourth Ward. Plus, it is linked directly to Atlanta BeltLine, a former railroad corridor around the core of Atlanta. Some of its vendors sell foods that reflect the best of Southern cooking, and others go further afield. Among them are Ton Ton, W.H. Stiles Fish Camp and Marrakesh and artisanal providers such as Farm to Ladle, Honeysuckle Gelato and Lucky Lotus. Legendary New York City Mayor Fiorello La Guardia created this market in the 1930's as a place for street vendors to sell their goods on the Lower East Side. Today, millennials, who have moved into the neighborhood in droves in search of cheap apartments, and others help its 23 independent merchants (19 selling food) thrive.